The site of a proposed warehouse expansion was underlain by very loose silty to clayey sands to depths of 6 to 8 feet, overlying soft sandy silt to depths of up to 11 ft.. Very loose to loose silty sands were present below the soft silt, to depths of 20 to 22 feet. The water table was about 4 feet below the ground surface. Due to floor loads of 850 psf, the project team decided to use ground improvement to allow shallow foundation construction and conventional grade supported floor slabs. TerraSystems was contacted after the owner first attempted Rapid Impact Compaction to stabilize the site. TerraSystems developed a design utilizing conventional stone columns throughout the building footprint. 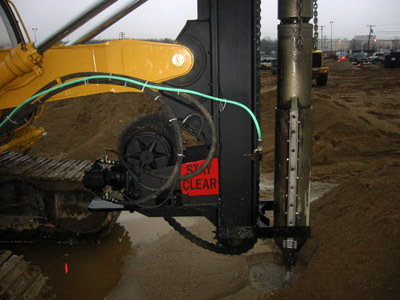 The columns were installed with our TerraPac rig, using water jetting to maintain open holes in the sandy soils. The Anheuser-Busch and general contractor’s representatives said they were very satisfied with the work.